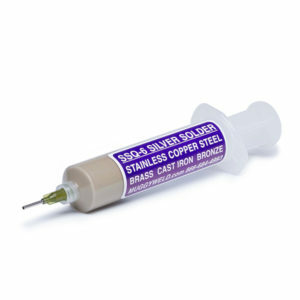 Using SSQ-6 silver solder paste, Mike silver solders a stainless steel plate to a piece of copper tubing. Just squeeze SSQ-6 from the syringe onto cold metal and use any torch to make the braze joint. A propane torch was used for this demo. Note: Please observe all AWS Safety & Health Guidelines when using Muggy Weld products. ©2019 MuggyWeld LLC - All rights reserved.